12 years after being closed because of the Oslo War, the archaeological site on Mount Gerizim reopened in a special ceremony. The archaeological excavation site on Mount Gerizim, near Shechem, was officially inaugurated in a special ceremony on Thursday. The ceremony was attended by Environment Minister Gilad Erdan (Likud), Shomon Regional Council head Gershon Mesika, the head of the Nature and Parks Authority Shaul Goldstein, and the Head of the Civil Administration in Judea and Samaria, Brig. Gen. Moti Almoz. Mount Gerizim and nearby Mount Eival are named in the Pentateuch as the place where the Priests and Levites addressed the tribes entering Israel after their sojourn in the desert, blessing them at Mount Gerizim if they kept G-d's commandments and elucidating the punishments they would receive at Mount Eival if they did not. Mount Gerizim is also an important place for the Samaritans, who believe that the preeminent holy spot is on the mountain and whose Temple was built there. Mount Gerizim was excavated for more than 24 years and Thursday’s ceremony marked the archaeological site’s reopening after being closed for 12 years since the start of the Oslo War, also known as the Second Intifada. Environment Minister Gilad Erdan said during the ceremony, “We have a struggle which is not so simple: these days, when the younger generation prefers to tack on to a smart phone, to cable TV and to the computer, we must stand up to the challenge and develop sites such as Mount Gerizim that connect the younger generation to the nature, history and heritage of the Jewish people. 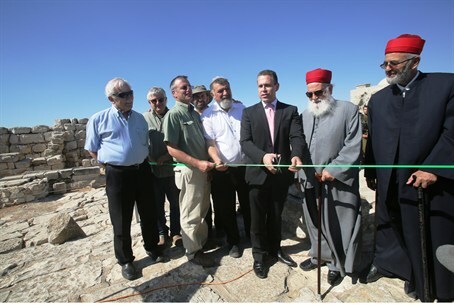 “As the Palestinians lead a false international campaign to end our connection to the Land of Israel, opening sites like Mount Gerizim will help us show the world that the Palestinian smear campaign is false and that it is impossible to sever the historical connection of the Jewish people to its land,” added Erdan.